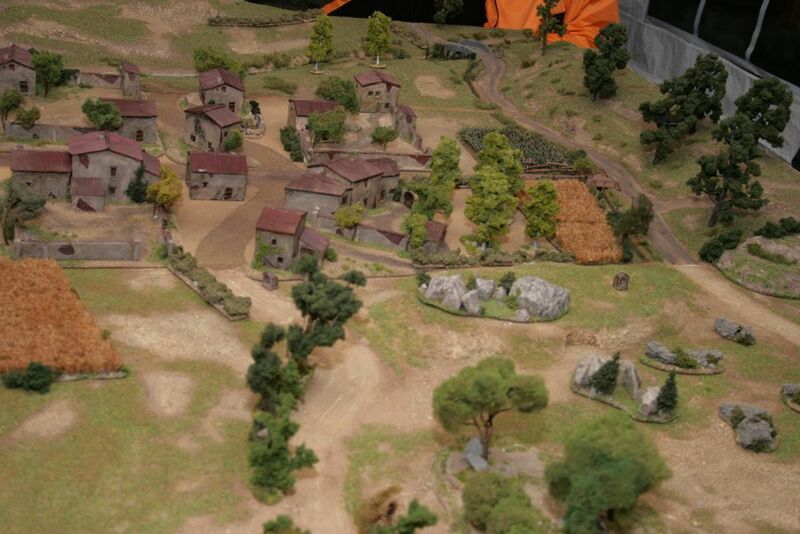 First of all I would like to mention the excellent gaming table and the great Game I had with Frank Bauer. 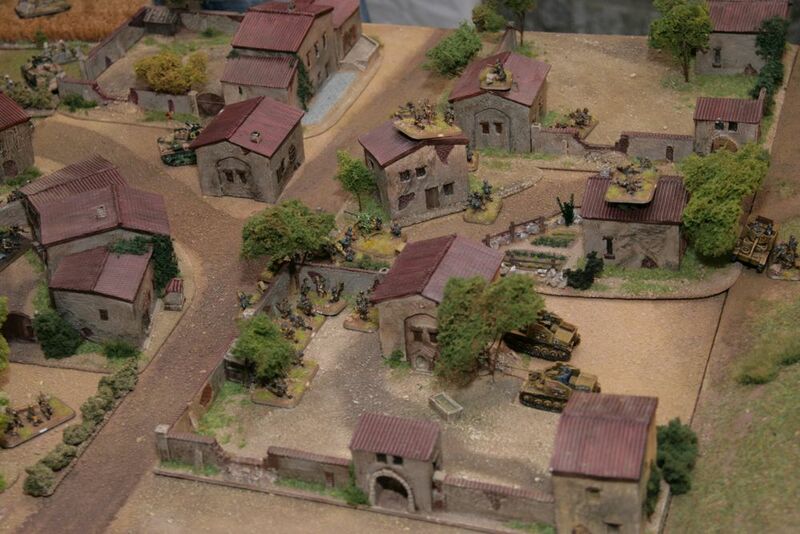 He built a great italian Gaming Table using the Italian Village Rusus and me designed last year. The models are still available and the range will be expanded. 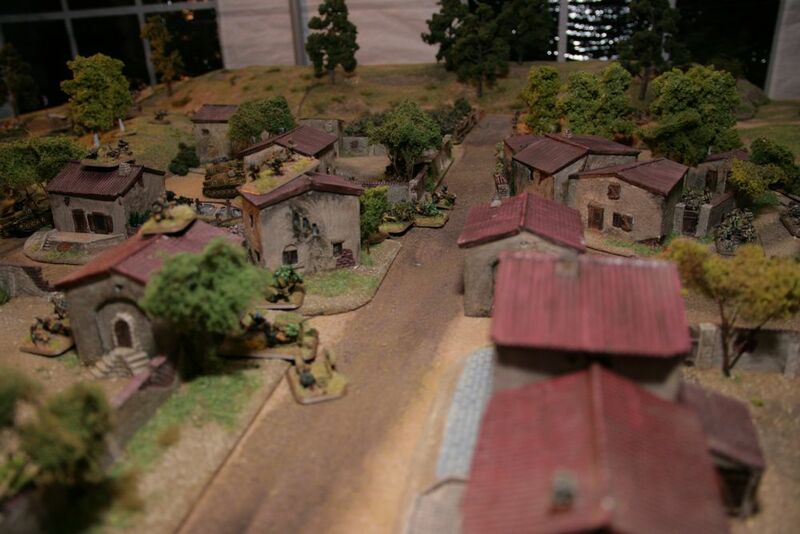 I use these great pictures in order to illustrate the army I used for the last 3 years mainly when playing FoW. 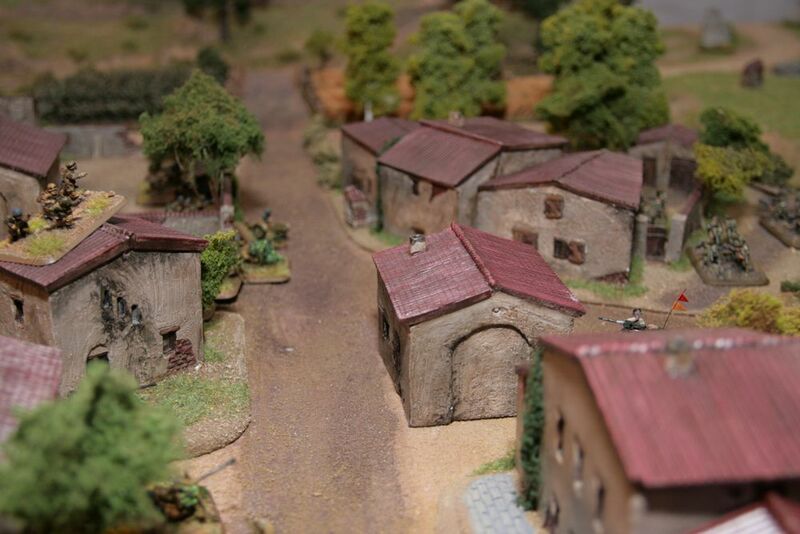 Yesterday I had the last game within our Club´s campaign in Mid War Tunisia with my Fallschirmjäger company. The game was a really good one, I fought against a 1300 points US paratrooper company attackin in the “King of the hill” scenary vs. my 1300 points defending Germans. Usually I do not talk very much about my games, since I play on a regular basis and keeping track of these games is quite a lot of work. 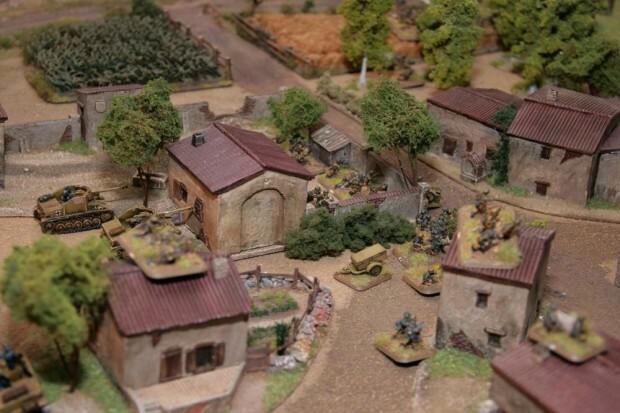 But this game was the last in the campaign which means that my Fallschirmjäger will now stay in their case for a while since my Hungarians will be used in our upcoming Ostfront Club Campaign. I started to collect the company in 2007, so it was almost three years of gaming and painting with this troops. I had to learn a lot about the german fighting doctrine e.g. Kampfgruppen or Stormtrooper movement and how to use them and not to forget about them. The Fallschirmjägercompany was very complicated to build and understand since there are lots of small weapons and different choices. In our campaign you are allowed to build an individual list for every game. Therefore it is very important to paint different choices in order to react to certain scenarios and different point sizes. In our campaign the size of the opponent force is usually not the same than yours since that is part of the strategical map movement. Two Panzerknackerteams in the HQ are absolutely great. 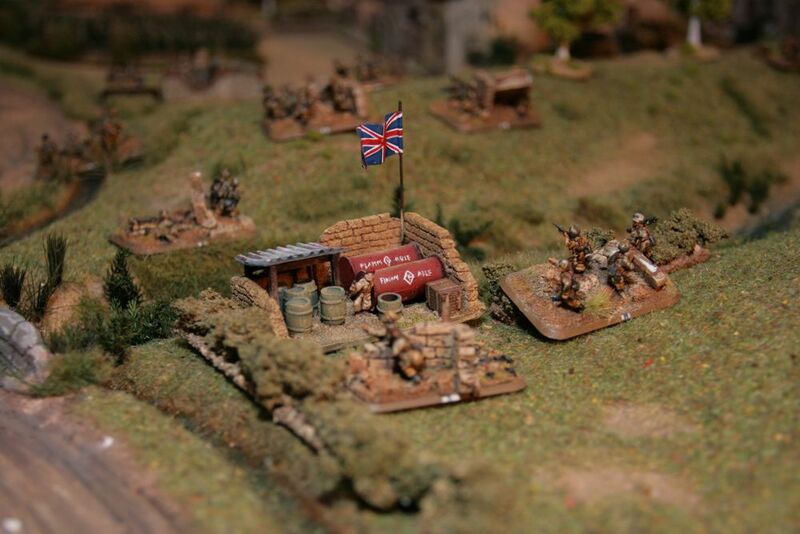 If you have 10 points in spare you can add two valueable tank hitting teams to your combat platoons. The Püppchen Werfer or the Anti tank rifle are also very valuable against Tank assaults since they both are man packed gun teams and may be attached to your combat platoons or Kampfgruppe. The light mortar options are not that good in my opionion. They are quite expensive. I would recommend all collectors to paint Stummelwerfer as a Mortar Platoon. 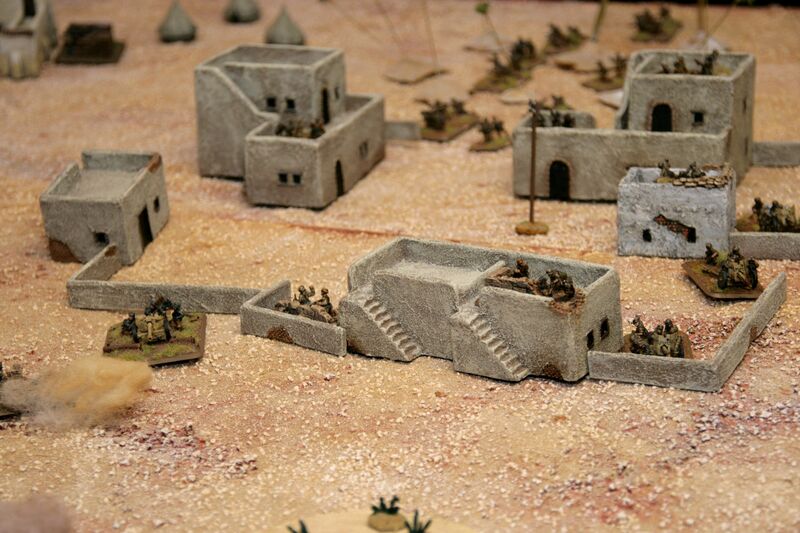 Then you can use them as a Mortar Platoon or a Mortar Option in the HQ. Quite flexible! Always paint two full infantry platoons of your Fallschirmjäger, always choose Panzerknacker SMG teams as command. They are really great. I tried a lot of army lists with 2 or 3 platoons infantry, which work excellent. Usually with 3 Infantry platoons there is at least one which is not at full strength. I painted an additional Pioneer platoon, which is interesting for games with fortifications or in games where you have to attack. A flamethrower which may pin down defenders could be very interesting. Moreover Pioneers have a good anti tank rating. So if you already have two platoons you should go for pioneers. Since the gear is pretty much the same you could change your whole company in a Pioneer troop with just up to 9 flamethrowers, if you have 9 sections in your combat platoons. Personally I did not want to paint the Pioneer HQ Options and sticked to the Fallschirmjäger Company. I prefer the latter since Pioneers do cost a lot of points. The FJ MG Platoon is great, since they may be attached to combat platoons as well. A must have for any FJ army. There may be two of these, but I painted only one. 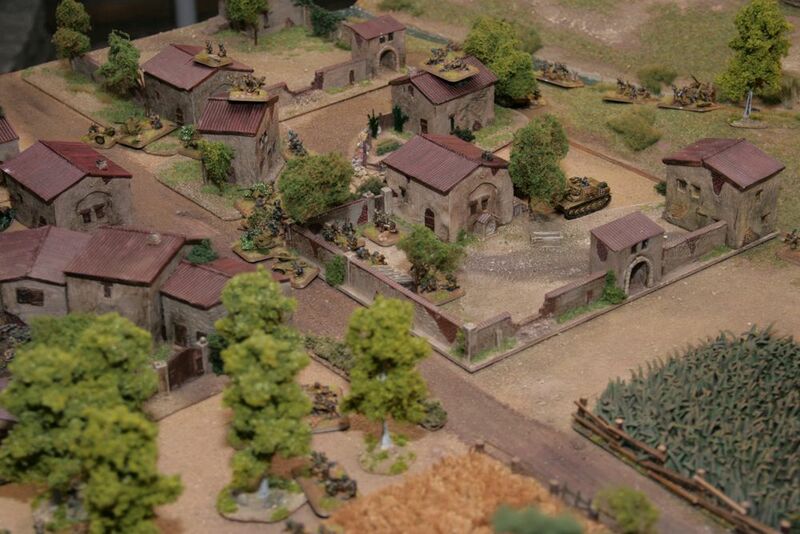 If you play a lot of infantry, Italians e.g. consider to paint two. But I think this will rarely happen. The Light Gun Platoon is sometimes very important. 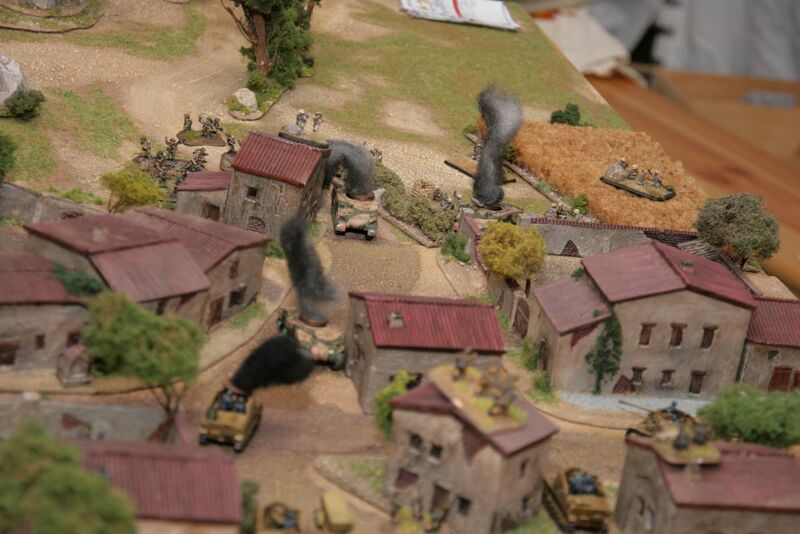 I often played with only 1300 points because within our Club´s campaign and then any anti tank capacity is welcome. The light weight guns are an interesting mixture when looking at their rules: Man packed, no gun shield, recoiless. One intersting aspect is that they can be part of a Kampfgruppe, as they are a weapon´s platoon. I played them quite often and they played often a mayor role in close combats with tanks next to objectives. The mortars are for sure a very important choice. Fallschirmjäger should often use smoke as an option vs. tanks and for attacking in close combat. You should definetly paint this platoon, I did not but should have. The mortars can be a HQ choice, too. 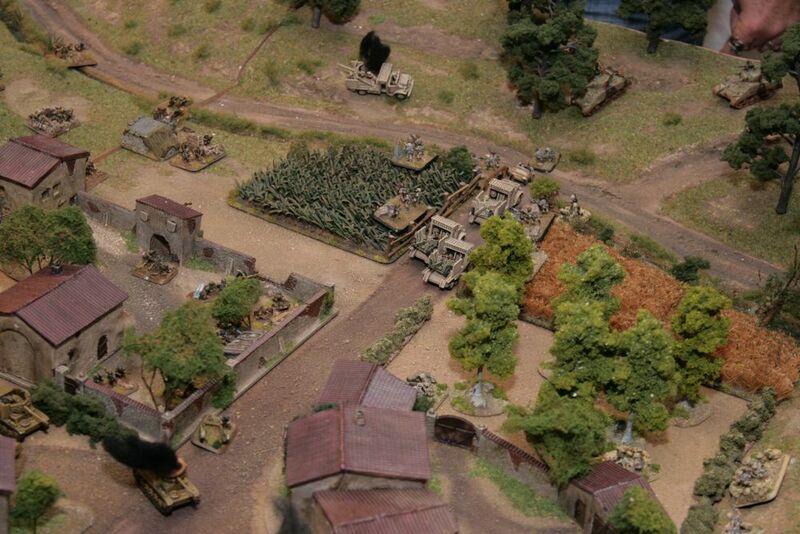 That can be interesting in order to have one platoon with artillery and infantry on the table. Any FoW gamer knows how essential Anti tank guns are in the game. So is for the Fallschirmjäger. First I painted the PAK 36 which was named Heeresanklopfgerät (Army´s Knocking device) because it was to light for Mid War Tanks. Without a Stielgranate it is almost impossible to knock out a Stuart from the front. Usually you may protect your infantry against tank assaults with that guns. With a Stielgranate there may be some chance but the low RoF and the distance are quite hard. Usually I use it against infantry, Universal carriers and Recce platoons (if I know about them). I painted one alternative and one Addition to the PAK 36: Marder II and PAK 40. Both have the excellent 7,5cm gun and provide excellent anti tank options. 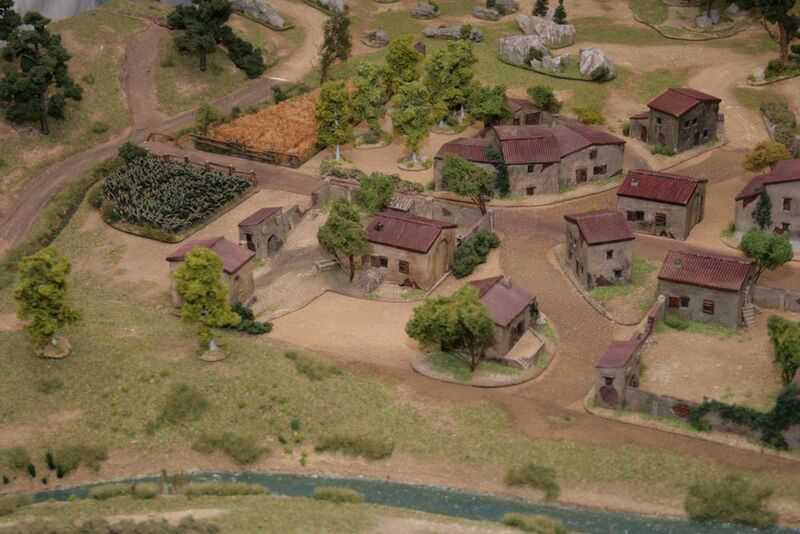 If they appear in the game your opponent will automatically focus on these platoons. Usually I only fielded one of the 7,5 cm options. The Marder II was reduced in his point costs in the “North Africa” book by Battlefront. Therefore I used them often in the last month whereas I did not when they costed 30 points more per tank. The heavy mortars were one of my favourite choices. They proved to be much better than the mointain gun, which I think is crap in the old book. In the new book the mountaingun was improved, but I still prefer one heavy mortar platoon sometimes im combination with medium mortars. For sure there is an Nebelwerferoption and more, but I prefer to play a straight FJ Force at this point. I am planning to have some allied forces in my upcoming army. 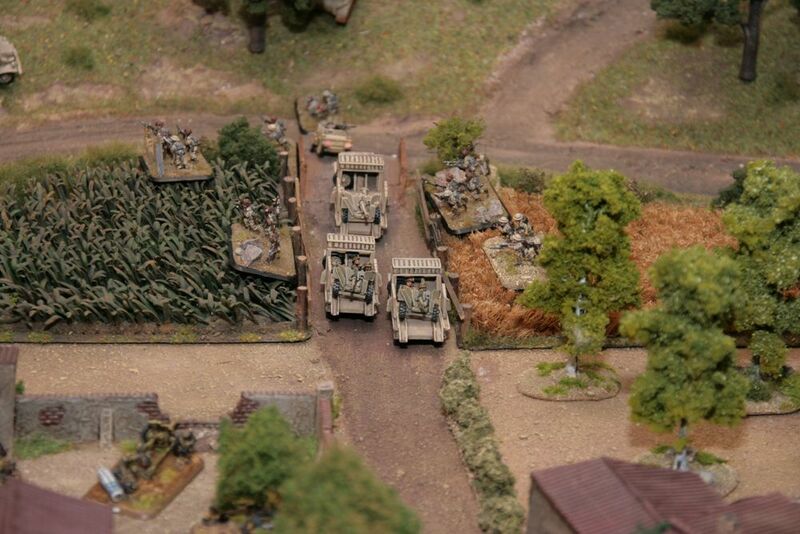 The Flak Choice was often on the table when I painted them. They provide affordable aircraft protection and may be used against infantry and vehicles, too. They are not unbeatable, but the price is low and they may move 10cm and an additional 10 cm Stormtrooper move. Air support was often chosen by my Allied opponents, so a general army list should contain at least 2 of these guns. I hope my ideas may help future Fallschirmjäger Company Commanders a little bit. Comments on these thoughts are welcome. I had approximatly 20 games with this force, they fought more victories than defeats, maily because I could always use different choices in my composition. When I learned to use the Stormtrooper rule, smoke, Combat Attachments and Kampfgruppe the force was very flexible and interesting. 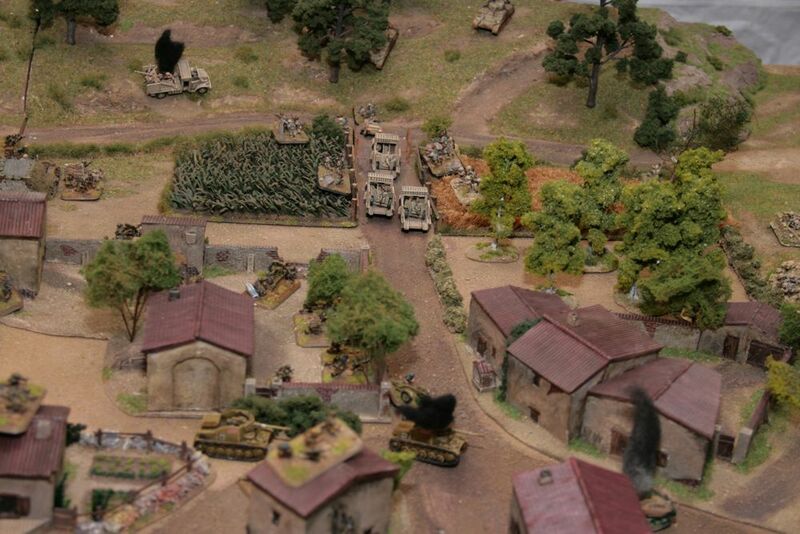 Like in the real war every game saw a lot of losses amongst the Fallschirmjäger – the Airborne Infantry was stubborn, brave and somewhat fanatic which ended often deadly in the hard circumstances in Tunisia and Italy. Also, if you are interested in joining us for a painting session in Pfungstadt on July 3rd, let me know. There will be a bunch of people meeting at my place. Hi Thomas, sounds very good either playing and Painting. My calender is pretty packed, too, so I hope to find a gap! It is good to know that the text was helpful. Lovely write up. I’m really impressed with Italian buildings. Do you know where I can get a hold of them? Hi Søren, I used to build these with Rusus, we used to sell them, but stopped that a while ago. So unfortunately they are not available any more.